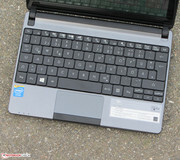 Packard Bell's EasyNote ME69BMP is conceived as a little 10-inch netbook for surfing, word processing and watching videos. The computer's technological highlight is its Celeron processor. It's based on the Silvermont architecture, just like Intel's current Atom processors. 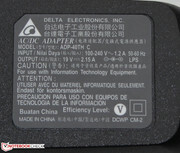 The CPU is supposed to require little energy and enhance the device's battery life. Is the netbook a success? Read on to find out. We will use the Medion Akoya E1317T (AMD A4-1200, Radeon HD 8180) and the Lenovo ThinkPad Edge E145 (AMD E1-2500, Radeon HD 8240) to assess the EasyNote ME69BMP in relation to its competition. 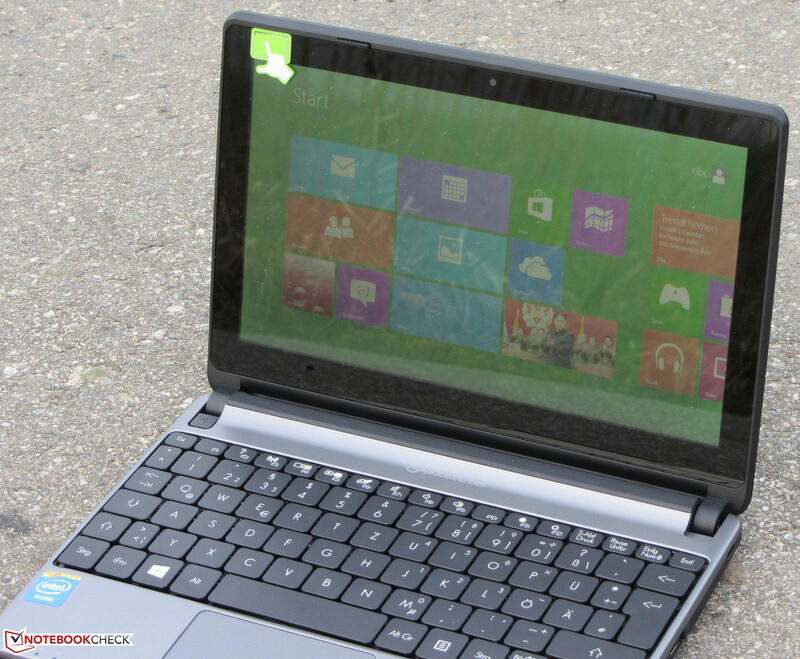 Lenovo's netbook has an 11.6-inch display. 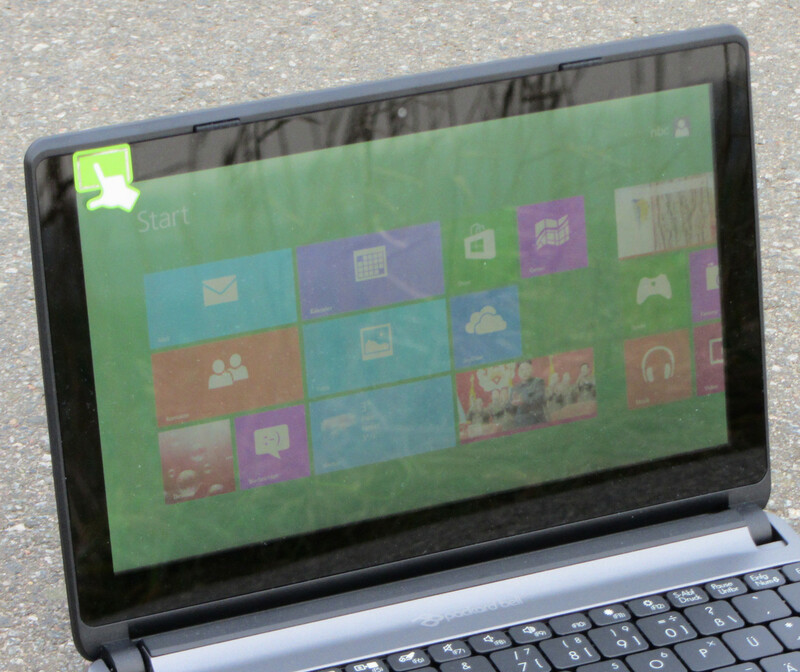 Like the Akoya and the ThinkPad Edge, the EasyNote is constructed entirely of plastic. The backside of the lid and the top of the base unit are tinted dark silver-gray, while the rest of the device is black. Good: Both of the netbook's colors are matte. In terms of manufacturing quality, the case is fairly solid. It has one weak spot at the front edge of the palm rest, where the base unit gives a little. The case resists twisting relatively well. The lid can only be twisted slightly, though it's sensitive to pressure from the back. We like the hinges; they're tightly adjusted and keep the display from bouncing. It's possible to open the lid with one hand. The backside of the lid is silver gray. Looks like a maintenance hatch, but alas, only a façade. Packard Bell proves to be a little stingy with their connectivity options. Buyers will have to make do without a USB 3.0 or an Ethernet port. Packard Bell is completely out of touch with the times here. Both the little Akoya and the ThinkPad Edge offer these two connections. Otherwise, all the ports you usually find on today's notebooks are available. For the most part, the connections are well-positioned. Only the memory card reader and audio jack are along the same horizontal strip as the palm rest. The EasyNote's Ethernet module is made by Atheros (AR9565) and supports the Ethernet standards 802.11 b/g/n. Its reception is good; the connection remains stable both in the router's immediate vicinity (about 3 meters) and two floors below the router (broadcasting power at about 50%). Packard Bell decided against an Ethernet slot. Instead, the computer is equipped with a Bluetooth 4.0 module. The integrated webcam has a resolution of up to 1280x720 pixels and produces a grainy image. Inside the netbook's packaging, you'll find a manual with warranty information, a quick-start pamphlet and a license sticker for MS Office 2013 Home & Student. 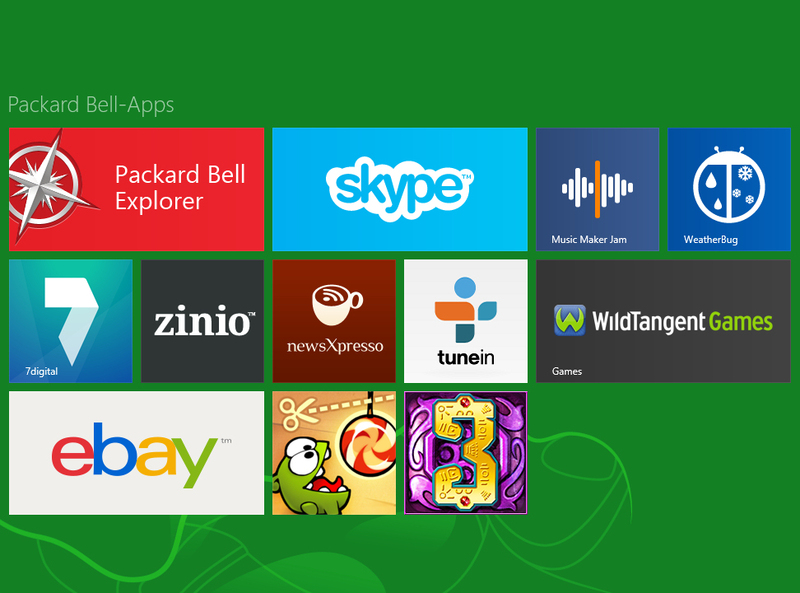 The EasyNote comes with Windows 8 pre-installed. Even though the netbook has a 64-bit CPU, Packard Bell installs the 32-bit version of Windows 8. Acer (owner of Packard Bell) cited "Microsoft's licensing policies" as their reasoning behind this. This argument doesn't quite make sense, as the Akoya - also a 10-inch netbook with a touchscreen - comes with the 64-bit version of Windows 8 and MS Office 2013 Home & Student. Price-wise the two devices are on common ground as well. Even though it appears that the underside of the computer is covered with a large maintenance hatch, this is in fact an illusion. Acer also affirmed this when questioned. Presumably, you could access the device's insides if you removed the keyboard. We decided not to attempt it, though, as it appeared that others had already tried it a few times on our test device. The EasyNote is outfitted with a 24-month warranty. The same goes for the Akoya. 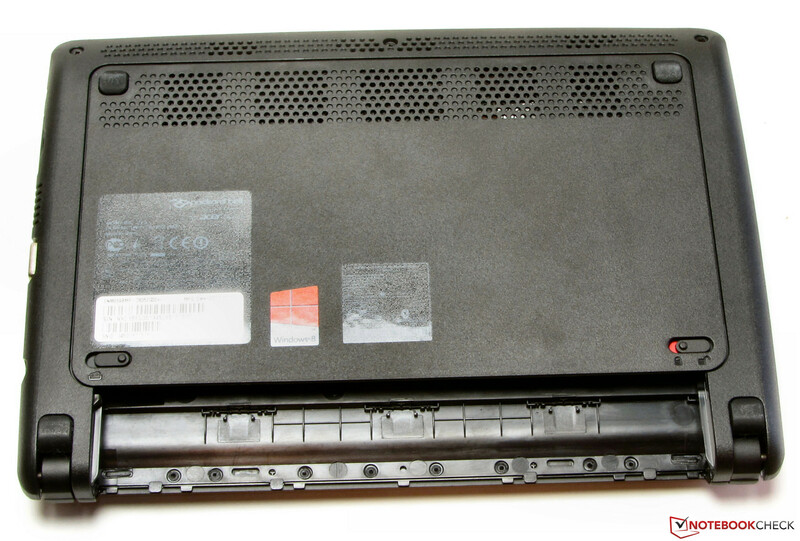 Buyers of the ThinkPad Edge will have to be content with a 12-month standard warranty. The EasyNote's warranty period can be extended to up to three years for an additional 70 Euros (~$95). Packard Bell equips its netbook with a standard, unlit keyboard. The keyboard takes up the full width of the device. The keys are set about 1.5 mm apart. The main keys measure about 16 x 15 mm. They have a short travel and clear click point, though the latter could be a little crisper. The keyboard yields a little bit as you type, but not enough to be considered a problem. All in all, this is a decent keyboard, and you can type quickly and fluidly on it. It does take a little getting used to. Because the keys are relatively close-set, it's easy to accidentally press two at once. The EasyNote's multitouch touchpad measures about 7.8 x 3.9 cm (3.1 x 1.5 inches). Fingers glide smoothly across the surface of the pad. The individual multitouch gestures can be turned on or off in the pad's configuration menu. Not every gesture is activated by default. The pad's mouse keys have a rough surface, a short travel and a clearly audible and palpable click point. Despite its small size, we like the pad overall. It gives the user very precise control over the mouse pointer. 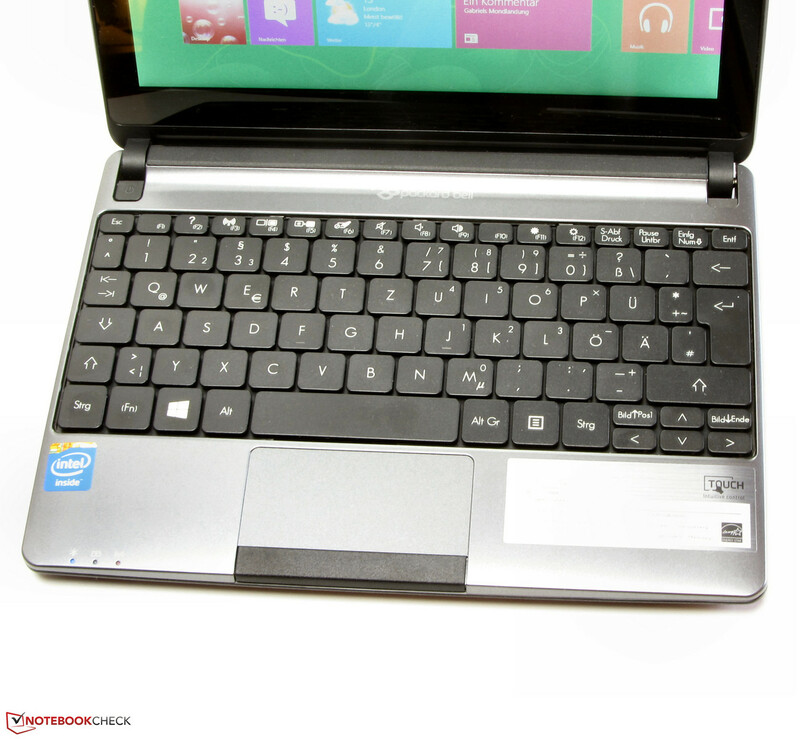 Packard Bell also equipped their netbook with a 10-point touchscreen. The screen functions perfectly and didn't cause us any problems. It reacts to input promptly. 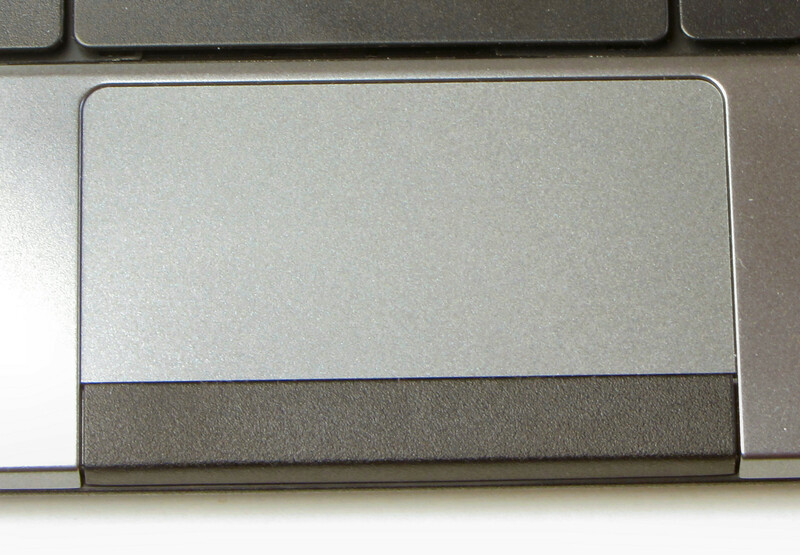 Packard Bell uses the full width of their netbook for the keyboard. The EasyNote's glossy display is of the 10-inch variety and has a native resolution of 1366x768 pixels. At an average of 186.1 cd/m², its brightness is a little below average for a netbook display. 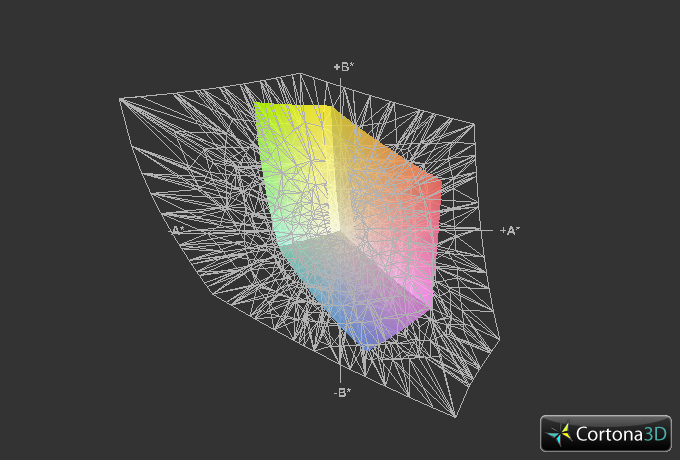 The Akoya (200.9 cd/m²) does only a little better here. Neither of the two devices can keep up with the ThinkPad Edge, at 266.1 cd/m². 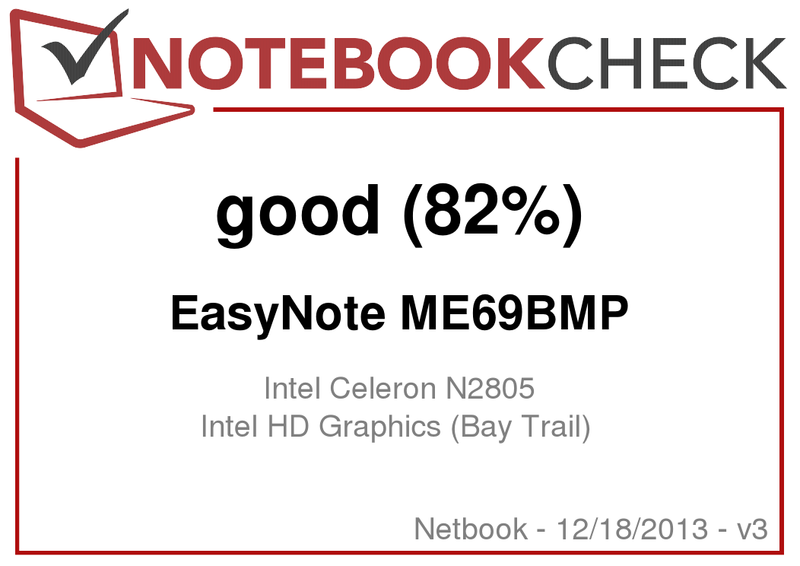 In the areas of contrast (388:1) and black value (0.5 cd/m²), the EasyNote's display continues its mediocre streak and offers no better than average numbers at best. 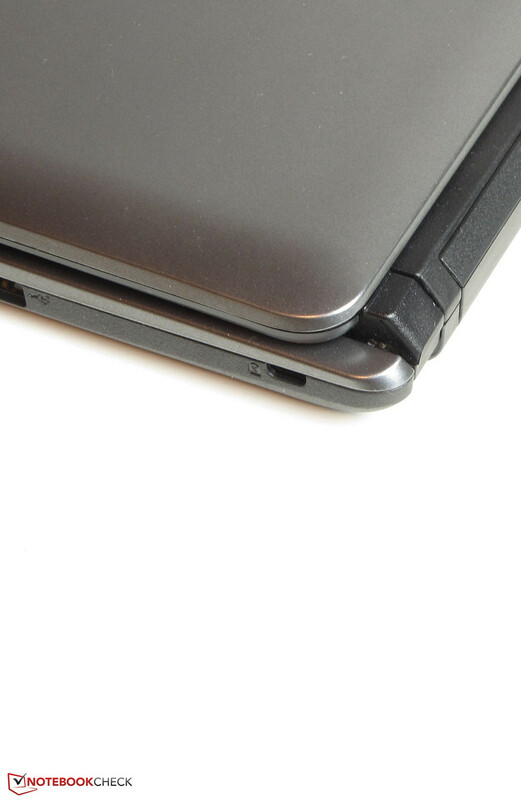 Things don't look any different for the Akoya (424:1, 0.5 cd/m²) or the ThinkPad Edge (330:1, 0.89 cd/m²). 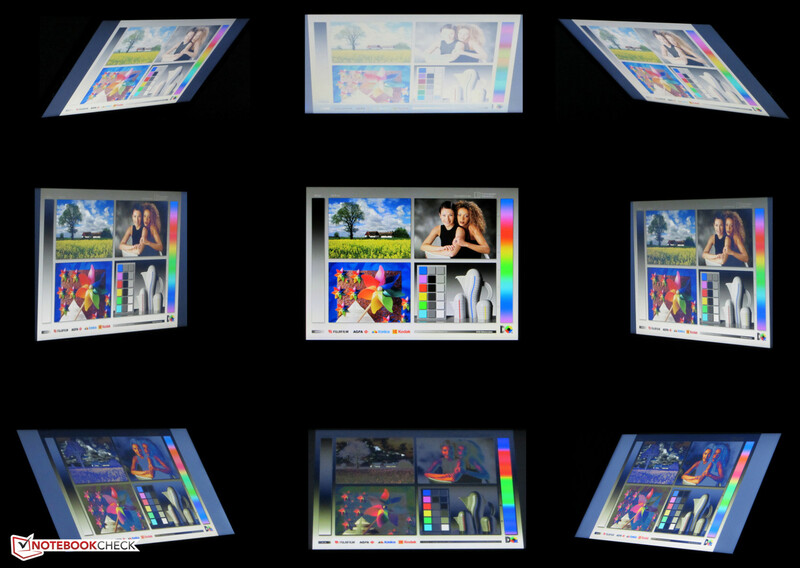 The screen can cover neither the sRGB nor the AdobeRGB color spaces. 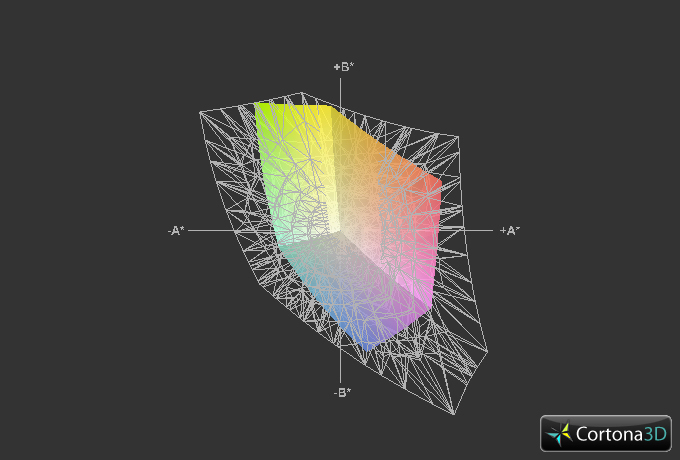 Color space coverage is important for tasks like professional image editing. The coverage rates come to 52% (sRGB) and 36.4% (AdobeRGB). Out of the factory, we tested the display (target color space sRGB) and measured an average DeltaE 2000 deviation of about 8.8. No color entered the target area (DeltaE less than 3). The display also has a noticeable blue cast. Outdoor use is only feasible when the sun isn't shining too brightly, as the display isn't one of the brightest of its kind. Also, the screen is highly reflective, so the display has to be strategically positioned to keep light from bouncing off the screen. The display's viewing angle stability is just as you might expect from a device in this price range: Along the horizontal, the display image remains stable from quite a wide range of angles. Several people could look at the monitor simultaneously. Along the vertical, however, the screen isn't so forgiving. As you change the angle, the image quickly distorts. 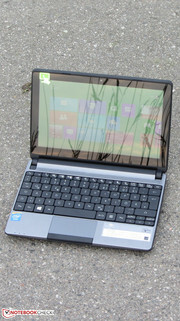 The little netbook is primarily designed for surfing, Skyping and writing. Thanks to the version of MS Office 2013 Home & Student preinstalled on the computer, the latter is no problem at all. Playing videos isn't a challenge for the device either. The EasyNote's GPU comes with a decoder that takes a burden off of the processor during playback. That includes Full HD material (1920x1080 pixels, H.264 coding). The EasyNote is available for about 300 Euros (~$410). We were unable to locate any alternative versions with different hardware. 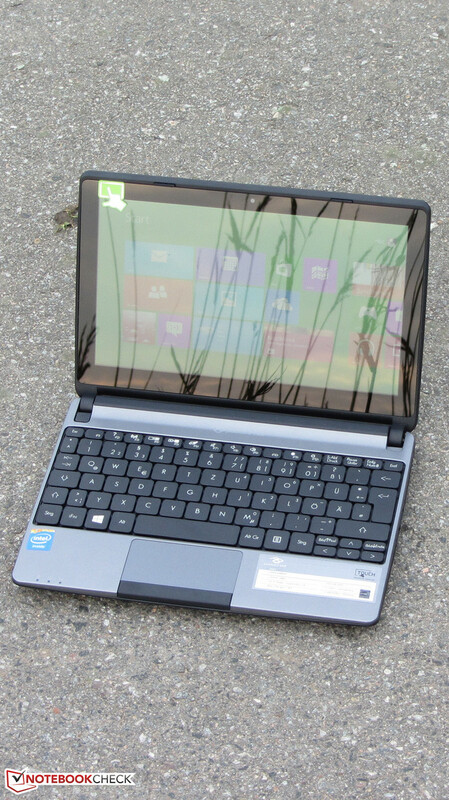 The EasyNote is powered by an Intel Celeron N2805. This dual-core processor is based on the new Bay Trail-M platform's Silvermont architecture -- the same platform as current Atom CPUs. The Celeron runs at a speed of 1.46 GHz. There is no turbo. The CPU doesn't require an especially large amount of energy; Intel estimates a TDP of 4.5 Watts. At that number, the CPU's energy consumption rate is on par with that of various AMD APUs from the A series - for instance the A4-1200 APU. Because only the 32-bit version of Windows is installed on the EasyNote, we were unable to run all of our benchmarks. We only used the 32-bit Cinebench 10 tests. In the CPU tests, the EasyNote placed just behind the Akoya (AMD A4-1200, Radeon HD 8180). The two computers have almost equally strong processors. The Geekbench 3 benchmarks also attest to this fact. One ought not to forget here that the Intel processor runs about 50% faster than the AMD processor. If the two ran at the same speed, the AMD would have a clear advantage. The ThinkPad Edge (AMD E1-2500, Radeon HD 8240) demonstrates that. Its processor runs only slightly slower than the Celeron, but it performs much better. It also needs considerably more energy, however. The Akoya and ThinkPad Edge APUs are based on the same architecture. The EasyNote isn't going to set any new records in terms of speed. 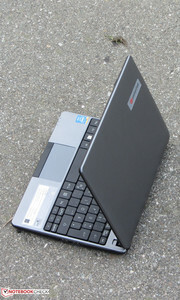 Like most netbooks, the Packard Bell computer is outfitted with comparably weak hardware. The user will occasionally experience short delays when switching between two windows, and loading the content of a folder takes some time. Nevertheless, subjectively the EasyNote feels a little quicker and more robust than the Akoya we recently reviewed, for example. The PCMark benchmark results reinforce this impression. The EasyNote does better here than both the Akoya (AMD A4-1200, Radeon HD 8180) and the ThinkPad Edge (AMD E1-2500, Radeon HD 8240). These results don't surprise us too much; we're used to seeing computers with AMD APUs hurting in the PCMark benchmarks. Intel CPUs are better suited to the test scenario. 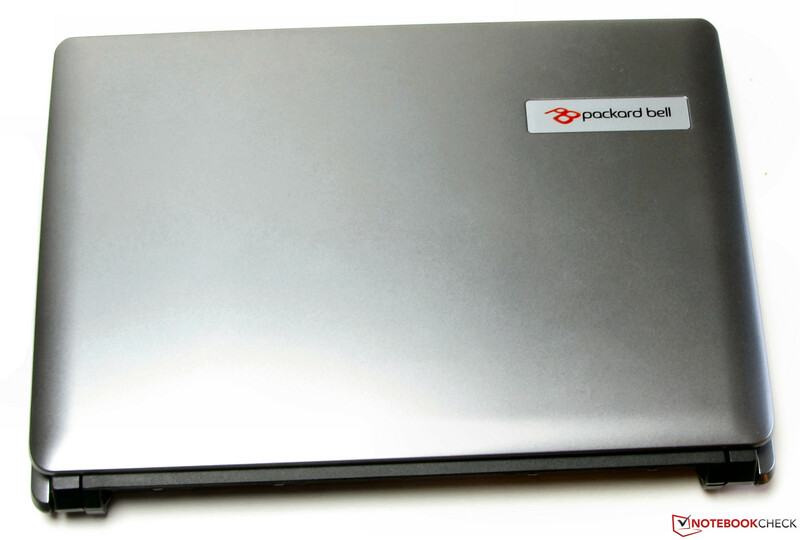 Packard Bell installs a 7 mm hard drive from Toshiba in our review device. It has a capacity of 320 GB and runs at 5400 rpm. CrystalDiskMark records a read speed of 66.09 MB/s. HD Tune reports an average transfer rate of 78.5 MB/s. Overall, these numbers are very low. We expect more of today's 5400 rpm hard drives. On the plus side, the hard drive manages a short access time of 16.4 ms.
Intel's Bay Trail generation HD Graphics core is responsible for the computer's graphics output. It supports DirectX 11 and runs at speeds between 400 and 667 MHz. Intel's graphics core can't keep up with the two AMD GPUs in any of the 3D benchmarks. The Akoya (AMD A4-1200, Radeon HD 8180) and especially the ThinkPad Edge (AMD E1-2500, Radeon HD 8240) achieve better results, though the Akoya's advantage over the EasyNote isn't huge. In the GL tests, the ThinkPad Edge comes in first, as it's outfitted with the strongest GPU. The EasyNote is not a device for PC gamers. The netbook manages to render a few games fluidly on the screen - at low resolution and low quality settings. This is true of the game StarCraft II: Heart of the Swarm, for instance. Tests we've conducted on other devices with the same GPU as the EasyNote reveal that games like World of Warcraft and Torchlight 2 are also playable. All in all, the EasyNote's processor and the Akoya's APU perform at the same level - the benchmarks we've covered up to this point show this to be the case. The EasyNote has a somewhat stronger processor at its command, while the Akoya has a somewhat stronger GPU. Our gaming tests reinforce the tie between the two devices in the area of performance: Sometimes the one achieves a higher frame rate, sometimes the other. Neither of the two competitors can keep up with the ThinkPad Edge here. In idle mode, we measure a sound pressure level of between 31.5 and 32.2 dB. The Akoya (30.2 to 33.2 dB) and the ThinkPad Edge (30 to 31.4 dB) are basically on par with the EasyNote here. Under medium (3DMark06 running) and full load (stress test, Prime95 and Furmark running), the EasyNote's noise emission rises to just 31.8 and 33.4 dB respectively. The noise levels of the Akoya (32.5 and 36.5 dB) and the ThinkPad Edge (32.8 and 35.1 dB) are a little higher. The Packard Bell EasyNote ME69BMP in the stress test. In idle mode, none of the three devices reach disconcerting surface temperatures. Even under load, their temperatures don't rise very high. The EasyNote warms up the most. In two different places it crosses the 40 °C (104 °F) mark. The EasyNote performs the stress test (Prime95 and Furmark running for at least an hour) the same way in both battery and AC power mode. 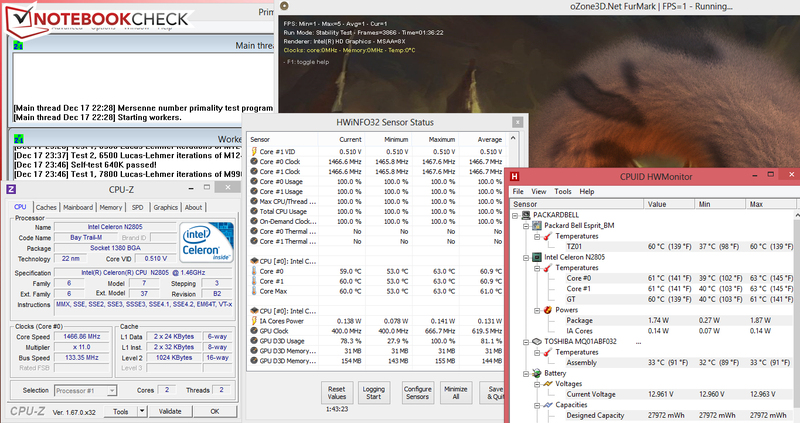 The CPU constantly runs at full speed (1.46 GHz), and the GPU mostly runs at full power (667 MHz). Occasionally the GPU drops to 400 MHz. The CPU temperature levels off at about 61 °C (141.8 °F) in AC power mode. (±) The average temperature for the upper side under maximal load is 33.7 °C / 93 F, compared to the average of 29.8 °C / 86 F for the devices in the class Netbook. (+) The maximum temperature on the upper side is 37.1 °C / 99 F, compared to the average of 33 °C / 91 F, ranging from 21.6 to 53.2 °C for the class Netbook. (+) In idle usage, the average temperature for the upper side is 26.7 °C / 80 F, compared to the device average of 29.8 °C / 86 F.
(-) The average temperature of the palmrest area of similar devices was 29.3 °C / 84.7 F (-6.2 °C / -11.2 F). 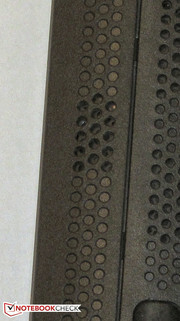 The stereo speakers are located at the front edge of the underside of the device. They produce a somewhat thin sound lacking in bass. Speech is easy to understand. External speakers or headphones will generate a better sound. In idle mode, the EasyNote's power consumption rate lies between 5.4 and 6.5 Watts. These are good numbers. The ThinkPad Edge proves to be a little more conservative (4.2 to 6.3 Watts). The Akoya (4.3 to 8.7 Watts) needs a little more energy than its competitors. Under medium load (3DMark06 running) and full load (stress test, Prime95 and Furmark running), the EasyNote's energy needs rise to up to 11.8 and 12.5 Watts respectively. The Akoya (12.5 and 13.6 Watts) is on par with the EasyNote here. The ThinkPad consumes more energy (14.9 and 20.1 Watts). In idle mode, the EasyNote runs out of steam after 6:18 h. The Akoya (8:24 h) and especially the ThinkPad Edge (19:43) chug along longer. 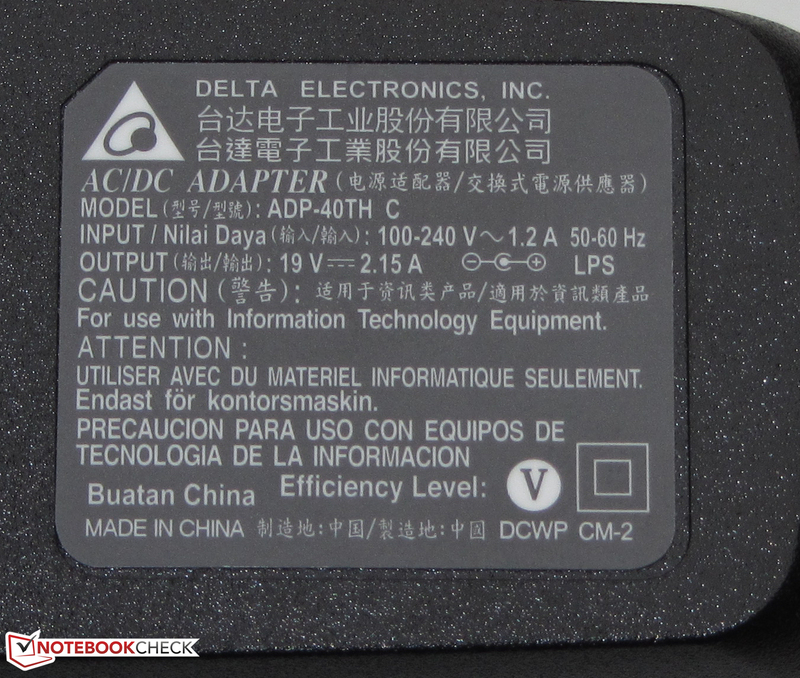 We assess a device's battery life in idle mode using the Battery Eater Reader's test. The display is regulated to its lowest brightness setting, the energy-saving profile is activated, and the wireless modules are turned off. Under load, the EasyNote plods along for 2:54 h. Again, the Akoya and the ThinkPad Edge reach better runtimes. We determine a device's battery life under load using the Battery Eater Classic test. 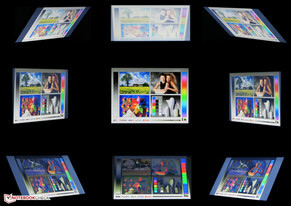 The screen glows at full brightness, the high-performance profile is activated, and the wireless modules are turned on. In the WLAN test, the EasyNote cuts out after 4:01 h, once again performing worse than the Akoya (5:04 h) and the ThinkPad Edge (8:19 h). For this test we run a script that loads a new website automatically every 40 seconds. The energy-saving profile is active and the display brightness is set to about 150 cd/m². We determine how long the computer can play a movie in battery mode by running the short film "Big Buck Bunny" (H.264 coding, 1920x1080 pixels) on a loop. The energy saving profile is active, the wireless modules are deactivated and the display brightness is set to 150 cd/m². The EasyNote hums along for 4:26 h. This time, too, the Packard Bell computer comes in behind the Akoya (4:53 h). We didn't run this test on the ThinkPad Edge. 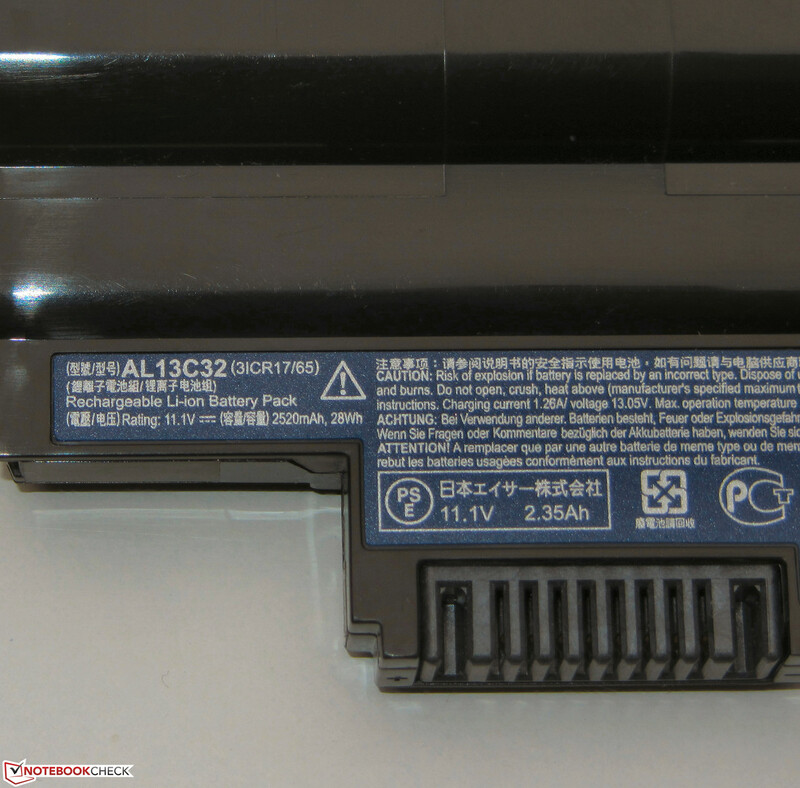 The ThinkPad Edge has its large battery capacity to thank for its long battery life (Packard Bell: 28 Wh, Medion: 33.75 Wh, Lenovo 63 Wh). The EasyNote's battery isn't even half as big. If you take this fact into account, the Packard Bell computer's battery runtimes are actually quite good. 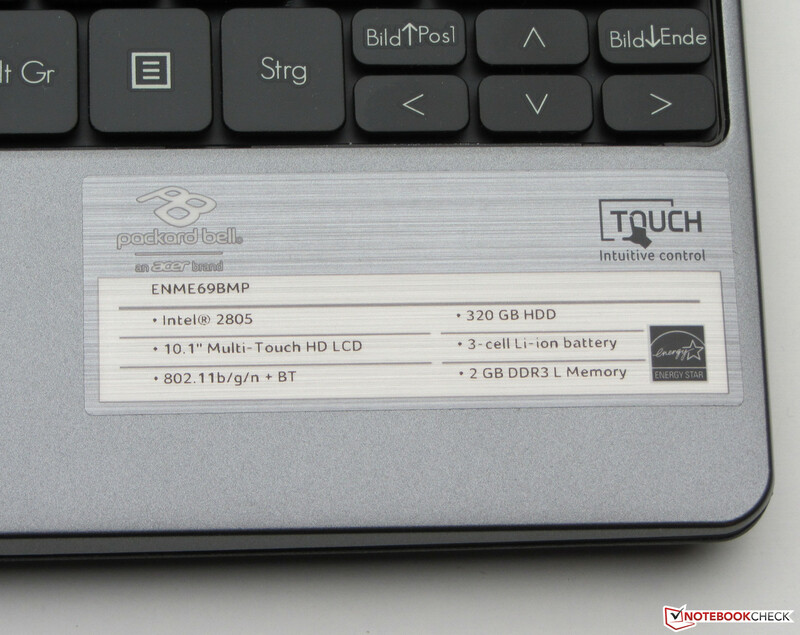 The Packard Bell EasyNote ME69BMP. 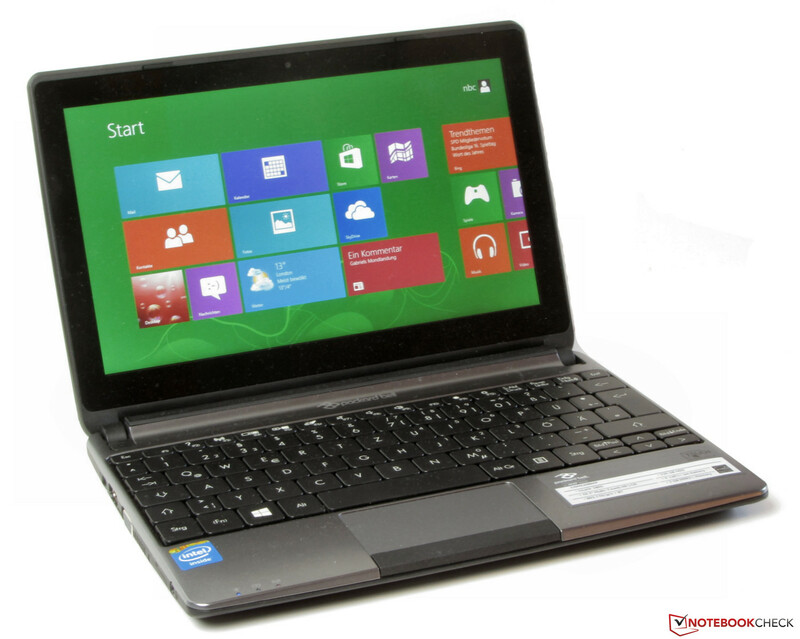 The Packard Bell EasyNote ME69BMP is equipped with a processor capable of performing everyday tasks. That includes surfing the internet, Skyping, playing videos and working on office tasks. The device always runs quietly and requires little energy. Furthermore, Packard Bell outfits the computer with a two-year warranty and includes MS Office 2013 Home & Student in their package. The buyer has to do without a USB 3.0 connection and an Ethernet port. Anyone who needs either of those two things won't be able to get by on this device. Also, the display has a blue cast and doesn't glow very brightly. If you're looking for a more extensive set of connections, the Medion Akoya E1317T may be right for you. 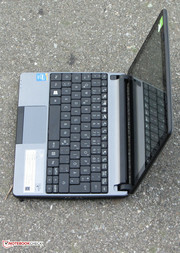 The Medion netbook has more ports than the EasyNote and also comes with a recovery DVD. In terms of price, the two netbooks are on par with each other. The Lenovo ThinkPad Edge E145 is the netbook of choice for more performance, longer battery life, a better keyboard and/or a brighter, matte display. Finally, we'd like to mention an alternative from the convertible computer market. 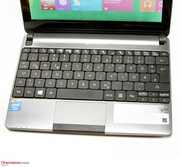 The Asus Transformer Book T100TA (Atom Z3740, HD Graphics (Bay Trail)) is a Windows 8 tablet (no Windows RT) with a connectable keyboard. The device is equipped with a brighter and significantly higher contrast display than the EasyNote. Furthermore, the convertible's keyboard did well in our test. 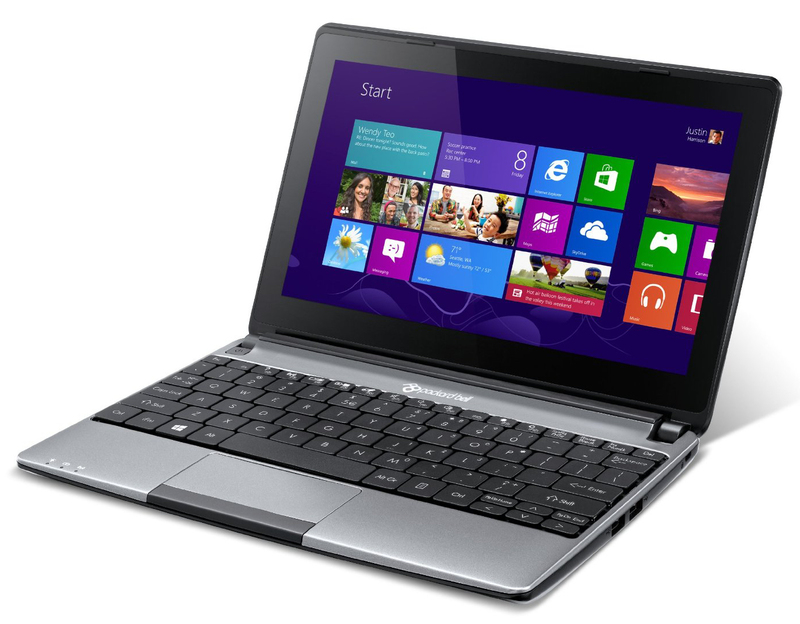 If you're torn as to whether to buy a tablet or a netbook, this convertible would be a good compromise. The computer is available starting at about 380 Euros (~$520) - including the keyboard. The EasyNote has a business-like appearance. The battery's weight comes to about 209 grams (0.46 lbs). 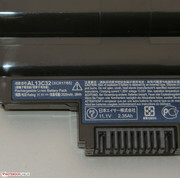 It has a capacity of 28 Wh. ...and has a nominal power rating of 41 Watts. 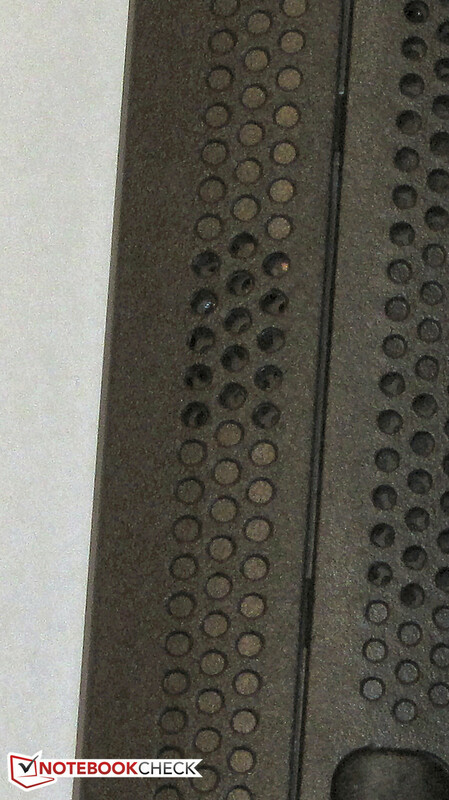 The speakers are located on the underside of the device. Packard Bell outfits the netbook with a variety of apps. 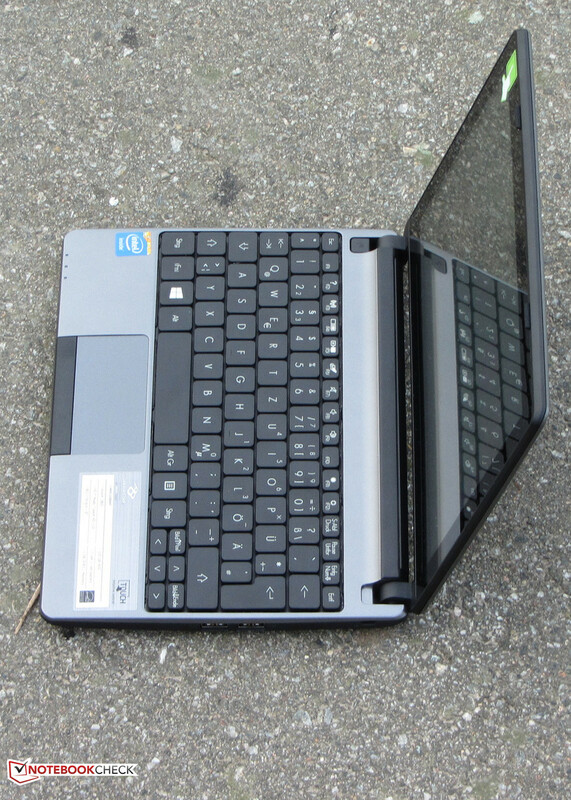 The netbook's quiet operation, low energy consumption and two-year warranty. USB 3.0, an Ethernet port and a better display. Packard Bell chose to leave out a USB 3.0 and an Ethernet port. Both of these connections should be standard for any computer on today's market. Lenovo ThinkPad Edge E145, Medion Akoya E1317T, Acer Aspire V5-131, Acer Aspire One 725-C7Xkk (11.6-inches), Acer Aspire One 756-B847X (11.6-inches), Asus Transformer Book T100TA-C1-GR (convertible), Lenovo IdeaTab Miix 10 64GB (tablet), HP Pavilion TouchSmart 11-e000sb (11.6-inches), Lenovo IdeaPad S210 Touch 20257 (11.6-inches), Acer Aspire V5-122P-61454G50NSS (11.6-inches), Lenovo ThinkPad Edge E130 (11.6-inches).